Cook & Harris Ltd. Is a privately owned and managed company which was formed in 1998 (previously to that date, it had been a partnership which had been set up in 1982) by Mike Harris and Steve Cook to provide high quality plumbing, heating installations and maintenance services covering all various aspects of building services required by domestic, commercial and industrial organisations. The company has grown and developed under the control of its two directors who are both experienced building services engineers. During this time, they have ensured that the company has complied with the latest requirements, skills, technologies and customer requirements which have emerged over that time. Cook & Harris Ltd is highly regarded in all aspects of its operations throughout the industry and has an ever expanding customer base. The company is capable of delivering mechanical projects up to £2 million in value, employs approximately 50 operatives and has a fleet of 20 mobile vans. Mike founded Cook and Harris Ltd in 1982 with his then partner Steve Cook. Mike has over forty years knowledge and experience in the industry and has guided Cook and Harris to become one of the region’s largest and best regarded plumbing and heating contractors. Mike is responsible for delivering the companies objectives and overseeing all departments. Rachel has been with Cook and Harris for over 12 years and is responsible for the full range of company finances whilst overseeing the office administration departments. Neil joined the team at Cook and Harris in 2010. Neil started his career as an apprentice and has worked in a number of roles in the building services industry. Neil heads up all estimating and business development within Cook and Harris. John has been with Cook and Harris for over 25 years and has a wealth of experience in the plumbing industry. John has built an expert knowledge of our clients’ needs and is extremely well regarded. He is responsible for managing the contracting teams, on site labour and sub-contractors. David joined Cook and Harris in 1991 and helped establish a commercial/industrial works department to the business. Following his semi-retirement in 2017, Dave retains his input as a director and offers guidance to the board based on over 50 years’ experience in business. Matthew manages our reactive and preventative maintenance teams as well as small works projects for the business. In a demanding role, Matt uses his experience as a time served pipefitter and gas engineer to aid and organise his teams to exceed customer expectations. Andy joined the management team of Cook and Harris in 2016 and supervises a number of our new build and commercial projects at any one time. Andy has significant management experience across all aspects of the building services industry having successfully run a M&E contracting business for many years. Cook & Harris Ltd have an ongoing commitment to Health & Safety. 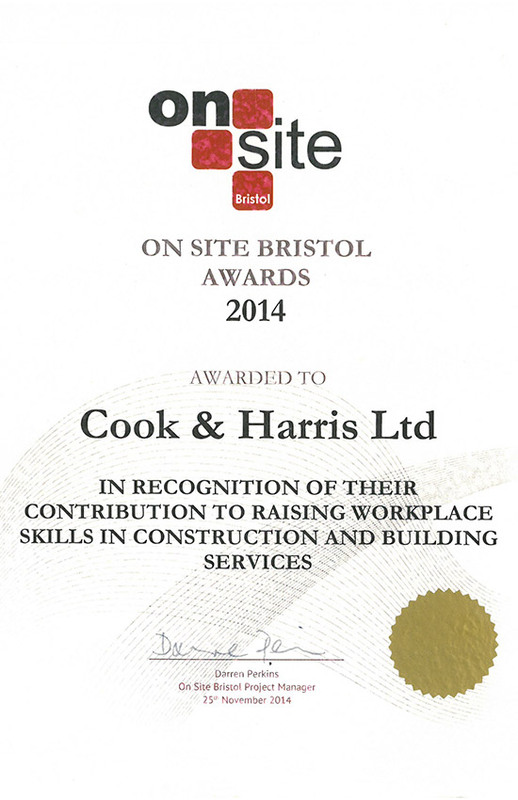 Cook and Harris are members of SMAS and the Building SafteyGroup and are subject to rigorous annual review with third party site assessment on a monthly basis. Every employee is issued with a copy of the company health & safety policy and there is an established procedure for up-dating and reporting. Our health & safety and environmental policies are available upon request Cook & Harris Ltd have encompassed the new C.O.S.H.H regulations in assessing all the chemicals and substances used within its operation and issued instructions on their control and use. Cook & Harris Ltd has also taken account of all the new legislation and has taken steps to ensure that all staff are informed and comply with the requirements of the new legislation. It is the duty of the company to ensure that all employees take all reasonable steps to prevent risks to health and personal injury arising out of the activities involved in company business. Disciplinary action will be taken against any employee who wilfully disregards the company health & safety policy. Cook & Harris Ltd are aware of the importance to the health, safety and welfare of its employees and of its clients, therefore so far as is reasonably practicable, Cook & Harris Ltd will ensure that its activities create no undue hazards to either its employees or clients. Cook and Harris Ltd are committed to the continuous development of its existing team and bringing new people into the industry. Working with local training providers we ensure our staff are kept up to date and knowledgeable around the core skills of the job, changes within our industry and health and safety. We have qualified engineers fully conversant in domestic and commercial gas systems, LPG installations, OFTEC oil installation, air source heat pumps, domestic sprinkler systems and many more integral and niche qualifications related to our industry. We can offer a team suitable for any mechanical project requirements. We take great pride in our long running and consistent apprenticeship intake. We believe that we have a duty to bring new people into the industry, offer them a skill set which will be a benefit for life and produce quality plumbers and pipefitters for the industry. The majority of the senior management team completed an apprenticeship at the start of their careers and appreciate that someone took the time to train us and set us a fruitful career path. We have an excellent retention rate for apprentices and we’re glad to say that they repay the investment year after year.